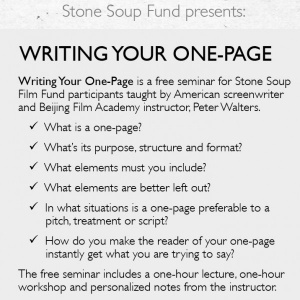 Writing Your One-Page is a free seminar for Stone Soup Fund participants taught by American screenwriter and Beijing Film Academy instructor, Peter Walters. What’s its purpose, structure and format? What story elements must you include? What elements are better left out? In what situations is a one-page preferable to a pitch, treatment or script? How do you make the reader of your one-page instantly get what you’re trying to say? The free seminar includes a one-hour lecture, one-hour workshop and personalized notes from the instructor. Visit Stone Soup Fund for details on how to receive 15,000 RMB for your next short film simply by writing a one-page. Purchase a ticket for 25 RMB (one ticket per person please). This fee is only a simple crowd control measure and will be returned to you on the day of the seminar. Ticket holders will be notified of the building and room number before the event. Based in Beijing and Los Angeles, Peter is one of the most sought after writers working in the Chinese film industry. He teaches screenwriting at Beijing Film Academy, is the co-founder of Scripted Writers Lab, and director of China Hollywood Society’s Beijing chapter. "Peter teaches material found nowhere else. You will learn things in this class you have never heard before." "Peter treats everyone's work as if it were the real business of film. His teaching method is based on practical experience as a professional writer." "Peter has rich experience in screenwriting and story presentation. He understands what young creators need and will do whatever he can to make you learn." "We did a lot of pitching and theory that made us better at marketing our work. It also helped me let go of my ideas, and made me willing to rewrite until the quality of the script comes through." "Peter's preparation and explanations made me understand exactly what I need to do write my ideas in a sellable form." A crowd-funding competition by and for filmmakers to fund short films. Interpreting China to the world through film. What’s shooting (and showing) in and around China. Complete script and story writing services.